I sometimes go through phases of eating particular foods. I wonder if this is because my body naturally requires something nutritional in the type of food I crave? A case in point is salmon. Although I generally tend to eat beef or chicken, sometimes only a salmon fillet will suffice. Perhaps my body is lacking omega-3 fatty acids or something at the time? 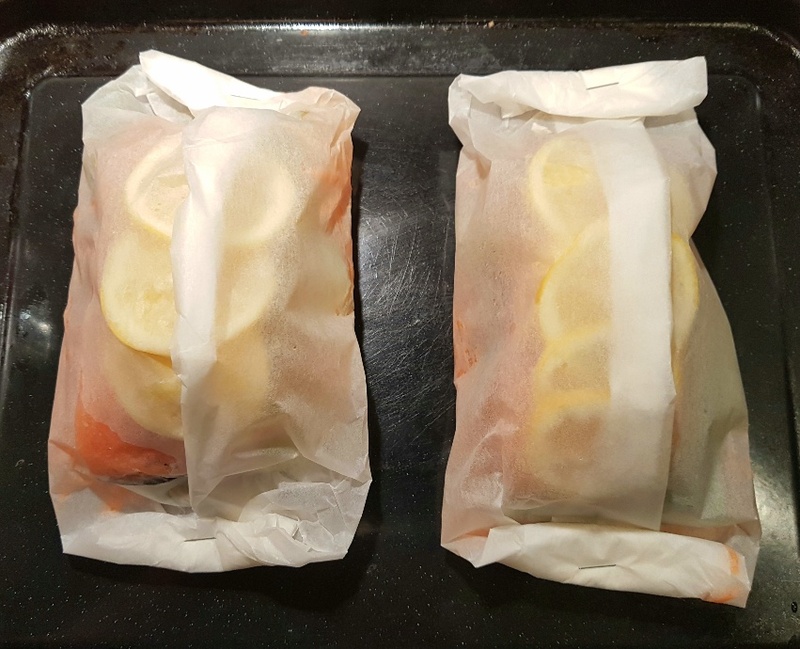 A brilliant way of cooking salmon to ensure that it remains tender and juicy is by the en papillote method which sees the piece of fish encased within a tightly sealed greaseproof paper packet and it is then steamed by its own juices. This ensures that the fish remains moist while at the same time it becomes infused with whatever flavours you have cooked alongside it, such as slices of fresh lemon or herbs. En papillote cooking means that you can flavour your chosen fish in many ways. 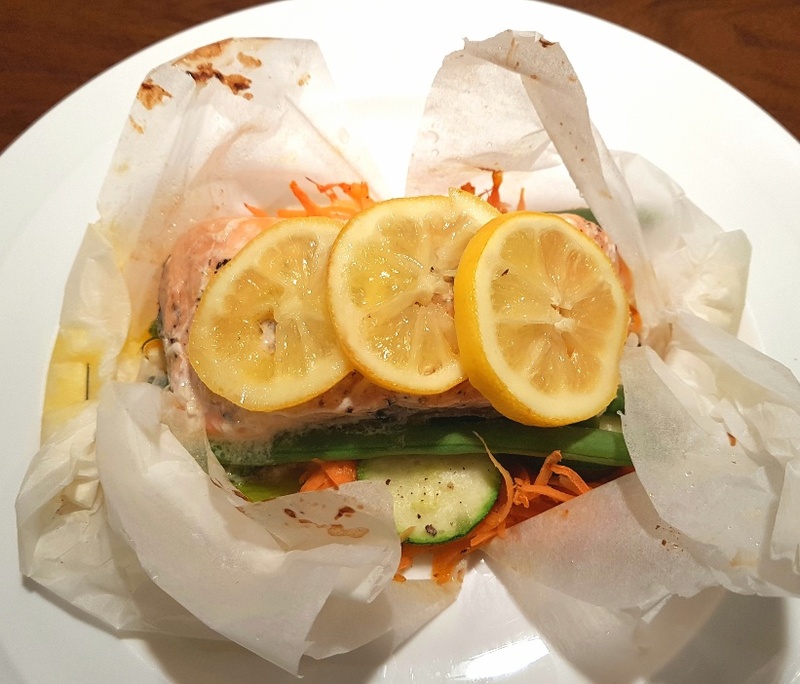 I chose to make my salmon en papillote with a simple butter and lemon dressing, but salmon en papillote is also fantastic with Asian flavours, such as soy sauce, lemongrass and ginger. You can use any low FODMAP vegetables you like in these en papillotes. I went with shredded carrot, courgette and green beans, but you could also use red or green bell peppers and bok choi if you fancy going down the Asian flavour route. Salmon en papillote takes very little time to prepare and it cooks in no time at all. 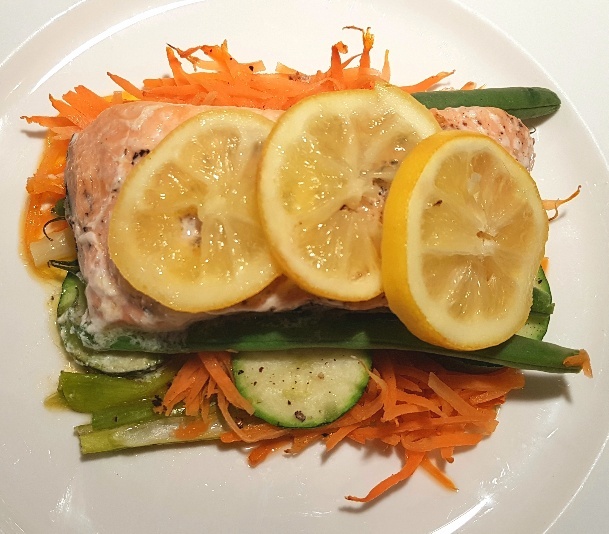 It makes a simple dinner or lunch that’s comprised of a delicate salmon fillet that’s infused with buttery lemon flavour and rests on a bed of tenderly steamed vegetables. You can’t go wrong with it at all really. Lay out two large pieces of greaseproof paper and, placing a pile in the middle of each sheet of greaseproof paper, divide the shredded carrot between the two sheets and scatter with capers. 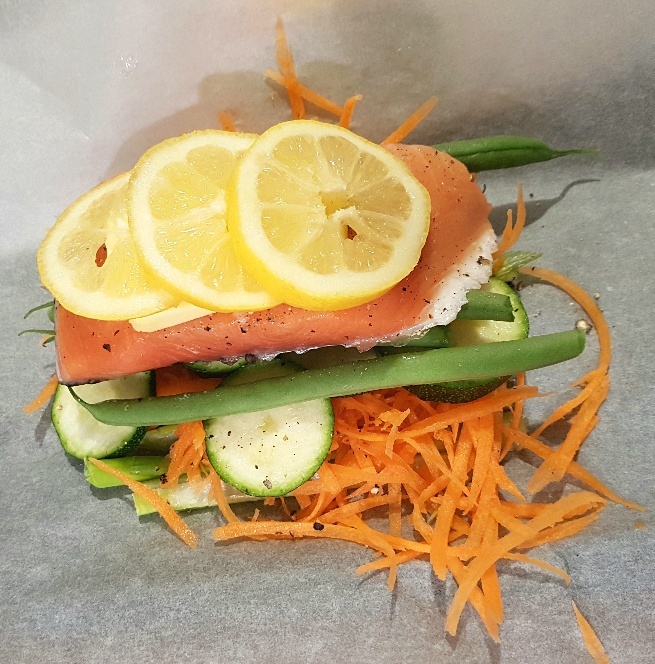 Put the courgette slices on top of the carrot, put 6 green beans on top that and then top with a salmon fillet. Season with salt and pepper. 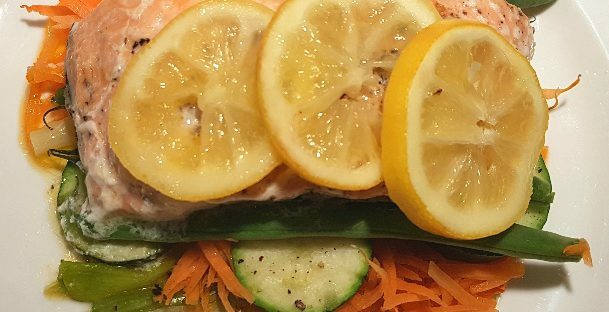 Place 1 tbsp of butter on top of each salmon fillet and cover the salmon with lemon slices. Fold the two largest sides of greaseproof paper together and fold them down until it is tightly wrapped. Place on a baking tray and bake in the oven for 10-12 mins before sliding the contents from the parcel and serving.